War is the third studio album by Irish rock band U2. It was produced by Steve Lillywhite, and was released on 28 February 1983 on Island Records. 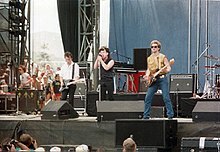 The album is regarded as U2's first overtly political album, in part because of songs like "Sunday Bloody Sunday" and "New Year's Day", as well as the title, which stems from the band's perception of the world at the time; lead vocalist Bono stated that "war seemed to be the motif for 1982." U2 recorded the album from September–November 1982 at Windmill Lane Studios with Lillywhite producing, the group's third consecutive album made at the studio with the producer. While the central themes of U2's previous albums Boy and October were adolescence and spirituality, respectively, War focused on both the physical aspects of warfare, and the emotional after-effects. Musically, it is also harsher than the band's previous releases. The album has been described as the record where the band "turned pacifism itself into a crusade." War was a commercial success for the band, knocking Michael Jackson's Thriller from the top of the UK charts to become the band's first number-one album there. It reached number 12 in the United States and became the band's first gold-certified album there. While poorly received by British critics at the time of release, War has since gained critical acclaim. In 2012, the album was ranked number 223 on Rolling Stone's list of "The 500 Greatest Albums of All Time". The group supported the album with the War Tour through the end of 1983. In August 1982, Bono and Ali honeymooned in Jamaica. It has been noted that it was not a typical honeymoon, as Bono reportedly worked on the lyrics for the upcoming album. The lyrics to "New Year's Day" had its origins in a love song Bono wrote for his wife, but the song was reshaped and inspired by the Polish Solidarity movement. The band began recording the album in September 1982 at Windmill Lane Studios in Dublin with producer Steve Lillywhite, their third consecutive record at the studio with the producer. The album's opener, "Sunday Bloody Sunday", an ardent protest song, stems from a guitar riff and lyric written by the Edge in 1982. Following an argument with his girlfriend, and a period of doubt in his own song-writing abilities, the Edge – "feeling depressed... channeled [his] fear and frustration and self-loathing into a piece of music." Early versions of the song opened with the line, "Don't talk to me about the rights of the IRA, UDA". After Bono had reworked the lyrics, the band recorded the song. The opening drum pattern soon developed into the song's hook. A local violinist, Steve Wickham, approached the Edge one morning at a bus stop and asked if U2 had any need for a violin on their next album. In the studio for only half a day, Wickham's electric violin became the final instrumental contribution to the song. During the sessions for "Sunday Bloody Sunday", Lillywhite encouraged drummer Larry Mullen, Jr. to use a click track, but Mullen was firmly against the idea. A chance meeting with Andy Newmark (of Sly & the Family Stone) – a drummer who used a click track religiously – changed Mullen's mind. Mullen used the click track to stay in time for other songs on the album. Mullen said of the album in a 1983 interview, "I think the drumming has always been pretty simple, I don't think it needs to be flashy. For War I use a click track, something I haven't used before, it's a way of keeping time in my headphones. When I listened to the music in time with the click track I knew I had to bring it down to the real basics. Hopefully for the next LP it will be more complicated, I'll move on. I think of it as a musical progression for myself because I learned a lot recording this album, just about my own style and that's what I wanted to do. I think there is a definite style on War where there isn't on the previous albums." Three of the tracks featured backing vocals by the Coconuts, of Kid Creole and the Coconuts. In the words of Steve Lillywhite, "they just happened to be in Dublin on tour, so we hung out with them and they came in and sang on 'Surrender'. So it was sort of random – this serious Irish rock band having the Coconuts on their album." The studio version of "40" was recorded during the final hours of the recording sessions in November 1982. Bassist Adam Clayton had already left the studio, and the three remaining band members decided they did not have a good song to end the album. Bono, the Edge, and Mullen Jr. quickly recorded the song with the Edge playing both the guitar and bass parts. Bono called the song "40" as he based the lyrics on Psalm 40. In live versions of the song, the Edge and Clayton switch roles, as Clayton plays guitar and Edge plays the bass. The opening 28 seconds of "Sunday Bloody Sunday", featuring the martial drumbeat, raw guitar, and bleak lyrics. "Sunday Bloody Sunday" is considered to be among the greatest political protest songs, and has remained a staple of U2's live concerts for 25 years. "Seconds" is a song about nuclear proliferation, and the possibility that Armageddon could occur by an accident. The track contains a sample from the 1982 documentary Soldier Girls. The Edge sings the first two stanzas, making it one of the rare occasions on which he sings lead vocals. In continuing the political motif of the album, "New Year's Day" is about the Polish solidarity movement. In 2004, Rolling Stone placed it as the 435th greatest song of all time. The song remains a staple of the band's live set, and is their third-most frequently performed song behind "I Will Follow" and "Pride (In the Name of Love)". "Like a Song…" was intended as a message to those who believed that the band was too worthy, sincere and not "punk" enough. Bono speculated that the song's punk attitude would have made more sense in the 1950s and 1960s, as opposed to the "dressing up" of the genre in the early 1980s. "Like a Song…" was only played live once. "Drowning Man" is the fifth track on the album. Its sound is a departure from the other tracks in War as it is a quiet, atmospheric song heavily influenced by the work of the Comsat Angels. It was never performed live, although there are also unconfirmed reports that it was performed at a concert in 1983. Other songs concern topics such as prostitution ("Red Light") and love ("Two Hearts Beat as One"). The album was first released on 28 February 1983. The original cassette release contains the entire album on each side. The album was titled War for several reasons; in 1982, Bono said, "War seemed to be the motif for 1982," adding that "Everywhere you looked, from the Falklands to the Middle East and South Africa, there was war. By calling the album War we're giving people a slap in the face and at the same time getting away from the cosy image a lot of people have of U2." The Edge said that "It's a heavy title. It's blunt. It's not something that's safe, so it could backfire. It's the sort of subject matter that people can really take a dislike to. But we wanted to take a more dangerous course, fly a bit closer to the wind, so I think the title is appropriate." The boy on the cover is Peter Rowen (brother of Bono's friend, Guggi). He also appears on the covers of Boy, Three, The Best of 1980–1990, Early Demos and many singles. 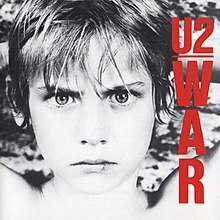 Bono described the reasoning behind the cover: "Instead of putting tanks and guns on the cover, we've put a child's face. War can also be a mental thing, an emotional thing between loves. It doesn't have to be a physical thing." In January 1983 (1983-01), "New Year's Day" was released internationally as the album's lead single. The single reached the top ten in the UK, and was the first release by the band to chart on the Billboard Hot 100. In March 1983, "Two Hearts Beat as One" and "Sunday Bloody Sunday" were released as singles in different regions. "Two Hearts Beat as One", a single in the US, UK, and Australia, reached number 18 on the UK Singles Chart; "Sunday Bloody Sunday", released in Germany and the Netherlands, reached number 3 on the Netherlands' charts. "40" was not released as a commercial single, but rather as a promotional single in Germany. Upon its release, several reviews were negative in the United Kingdom. Gavin Martin of NME made a parallel between 1980's Boy and War, stating that "where Boy shone and flowed War is dull and static, and where Boy propelled lucid pellets of fire and imagination War cranks out blank liberal awareness"; he felt that after the single "New Year's Day", which he considered as "their finest single since "I Will Follow", War "declines quite dramatically", ultimately calling the album "another example of rock music's impotence and decay". Sounds shared a similar point of view, recognising that the two singles were "by far the strongest tracks" on War, but that "for the remainder, they are a (dejected sounding) mixture of the incomplete, the experimental (in the simplest sense) and the plain sub-standard." By contrast, in the United States, Rolling Stone published a favourable review, with critic J. D. Considine stating: "Generally, the album's musical strengths are largely the product of well-honed arrangements and carefully balanced dynamics. Even as the Edge spins increasingly sophisticated guitar lines, he maintains the minimalist bluntness that sparked Boy. And while bassist Adam Clayton and drummer Larry Mullen Jr. have swung to more dance-oriented rhythms, their songs hurtle along with the sort of brusque purposefulness more frequently associated with punk." Considine added: "the songs here stand up against anything on the Clash's London Calling in terms of sheer impact, and the fact that U2 can sweep the listener up in the same sort of enthusiastic romanticism that fuels the band's grand gestures is an impressive feat. For once, not having all the answers seems a bonus." Robert Christgau of The Village Voice wrote that "the deadly European virus that's always tainted this band turns out to be their characteristic melodic device", adding that "The Edge becomes a tuneful guitarist by the simple expedient of not soloing, and if Bono has too many Gregorian moments his conviction still carries the music." Philip Smith of the New Zealand Herald commended the band's maturing sound and labeled the album "a classic". He concluded his review, "So U2 have set out to make a big statement on a subject close to the Irishmen's hearts – and they have succeeded." War was a commercial success, becoming U2's first number-one album in the UK and supplanting Michael Jackson's Thriller at the top of the charts. The album placed sixth on The Village Voice's 1983 year-end Pazz & Jop critics' poll. In 1989, War was ranked number 40 on Rolling Stone magazine's list of "The 100 Greatest Albums of the '80s". In 2012, the album was ranked number 223 on Rolling Stone's list of "The 500 Greatest Albums of All Time", as well as being listed at number 94 on Slant Magazine's "Best Albums of the 1980s." In support of the album, the band began touring on 1 December 1982. The first month of shows, referred to as the "Pre-War Tour", preceded the album's release and the bulk of the tour, and was meant to showcase and test the new songs in a live setting. The War Tour proper began on 26 February 1983 and lasted until 30 November of that year. In total, the band played 110 gigs in Europe, the US, and Japan to promote War. Over the course of the tour, the band began to play progressively larger venues, moving from clubs to halls to arenas. Bono attempted to engage the growing audiences with theatrical, often dangerous antics, climbing scaffoldings and lighting rigs and jumping into the audience. The sight of Bono waving a white flag during performances of "Sunday Bloody Sunday" became the tour's iconic image. The band played several dates at large European and American music festivals, including a performance at the US Festival on Memorial Day weekend for an audience of 125,000 people. The group's 5 June 1983 concert at Red Rocks Amphitheatre on a rain-soaked evening was singled out by Rolling Stone as one "50 Moments that Changed the History of Rock and Roll". The show was recorded for the concert video Live at Red Rocks and was one of several concerts from the tour captured on their live album Under a Blood Red Sky. Both releases received extensive play on the radio and MTV, expanding the band's audience and showcasing their prowess as a live act. During the tour, the group established a new tradition by closing concerts with "40", during which the Edge and Clayton would switch instruments and the band members would leave the stage one-by-one as the crowd continued to sing the refrain "How long to sing this song?". The War Tour was U2's first profitable tour, grossing about $2 million. All tracks written by U2. In 1993, Mobile Fidelity Sound Lab remastered the album and released it as a special gold CD. This edition has slightly different running times: most notably, "Seconds" runs 3:22, adding 11.5 seconds in the break section (beginning at approx. 2:03), while "Like a Song…" runs 5:00, extending the playout section (beginning at approx. 4:45). Standard format: A single CD with re-mastered audio and restored packaging. Includes a 16-page booklet featuring previously unseen photos, full lyrics and new liner notes by Niall Stokes. The 10-tracks match the previous release of the album. Deluxe format: A standard CD (as above) and a bonus CD. Bonus CD includes b-sides, live tracks and rarities. Also includes a 32-page booklet with previously unseen photos, full lyrics, new liner notes by Niall Stokes, and explanatory notes on the bonus material by the Edge. Vinyl format: A single album re-mastered version on 180 gram vinyl with restored packaging. The Edge – guitar, piano, lap steel guitar, backing vocals, lead vocals on "Seconds", bass guitar on "40"
Kenny Fradley – trumpet on "Red Light"
Steve Wickham – electric violin on "Sunday Bloody Sunday" and "Drowning Man"
The Coconuts: Cheryl Poirier, Adriana Kaegi, Taryn Hagey, Jessica Felton – backing vocals on "Like a Song…", "Red Light", and "Surrender"
^ a b c d e f Thrills, Adrian (26 February 1983). "War & Peace". NME. Archived from the original on 17 July 2011. Retrieved 7 November 2007. ^ a b c Considine, J. D. (31 March 1983). "War". Rolling Stone (392). Retrieved 30 December 2010. ^ Hilburn, Robert (8 August 2004). "Where Craft Ends and Spirit Begins". Los Angeles Times. section Calendar, p. E1. Retrieved 12 August 2011. ^ a b "Larry Mullen Interview". atu2. White Lucy. 1 April 1983. Retrieved 5 June 2017. ^ "U2's producer reveals studio secrets". BBC News. 18 July 2008. Retrieved 12 August 2011. ^ Barrett, Annie (22 November 2004). "On the Edge". Entertainment Weekly. Retrieved 12 August 2011. ^ Hutchinson, John (September 1986). "U2's Leading Edge". Musician: 33 – via Rock's Backpages. ^ VH1 Editors (2004). VH1's 25 Greatest Political Protest Songs (Television series). VH1 television. ^ U2gigs.com. "U2 on Tour - played songs: Sunday Bloody Sunday". Retrieved 7 March 2008. ^ "Seconds by U2". Songfacts.com. Retrieved 14 January 2008. ^ "500 Greatest Songs of All Time: U2, 'New Year's Day'". Rolling Stone. 7 April 2011. Retrieved 5 June 2017. ^ "All songs U2 ever played in concert". U2gigs.com. Retrieved 12 March 2008. ^ "Like a Song". U2gigs.com. Retrieved 12 March 2008. ^ "1983-06-03: Salt Palace Assembly Hall - Salt Lake City, Utah, USA". U2gigs.com. Archived from the original on 19 July 2008. Retrieved 19 July 2008. ^ Erlewine, Stephen Thomas. "War – U2". AllMusic. All Media Network. Retrieved 30 December 2010. ^ Bertin, Michael (30 March 2001). "Record Reviews – The U2 Catalog: War". The Austin Chronicle. Retrieved 7 February 2011. ^ Hyden, Steven (28 July 2008). "U2". The A.V. Club. Retrieved 24 September 2015. ^ Tangari, Joe (24 July 2008). "U2: Boy / October / War". Pitchfork. Retrieved 30 December 2010. ^ Griffiths, Nick (September 1991). "U2: War". Select (15): 82. ^ a b Christgau, Robert (28 June 1983). "Christgau's Consumer Guide". The Village Voice. Retrieved 24 September 2015. ^ Martin, Gavin (26 February 1983). "Run Aground On Rock". NME. ^ "Battle-Fatigued". Sounds. 26 February 1983. ^ Smith, Philip (23 May 1983). "Review: War". The New Zealand Herald. Retrieved 14 February 2017. ^ "The 1983 Pazz & Jop Critics Poll". The Village Voice. 28 February 1984. Retrieved 11 March 2011. ^ "100 Greatest Albums of the 80's". Rolling Stone (565). 16 November 1989. ^ "The 100 Best Albums of the 1980s". Slant Magazine. 5 March 2012. Retrieved 5 June 2017. ^ "U2 tour details". U2Tours. 1 January 2000. Retrieved 29 February 2008. ^ "@U2 Podcast, Edition 4-2 "The @U2 Warcast". atU2. 29 February 2008. Archived from the original on 23 April 2008. Retrieved 29 February 2008. ^ Futterman, Erica (11 February 2008). "News Ticker: Ozzfest, Pete Townshend, U2, Dr. Dre". Rolling Stone. Retrieved 12 March 2008. ^ a b "Boy, October, War: Remastered". U2.com. 9 April 2008. Retrieved 9 April 2008. ^ a b "Certificações de U2" (in Portuguese). Pro-Musica. Retrieved 14 January 2019. ^ "LES DISQUES D'OR/DE PLATINE - ALBUMS - 2009". Ultratop (in French). Hung Medien. Retrieved 24 January 2010. ^ "RPM100 Albums". RPM. 38 (13). 28 May 1983. Retrieved 25 November 2009. ^ a b "Gold and Platinum Search: War". Music Canada. Archived from the original on 4 June 2012. Retrieved 29 August 2011. ^ "France Album Sales: U2". Chart Masters. Retrieved 5 June 2017. ^ "Gold-/Platin-Datenbank (U2; 'War')" (in German). Bundesverband Musikindustrie. Retrieved 4 January 2010. ^ "Goud/Platina" (in Dutch). NVPI. Archived from the original on 18 January 2010. Retrieved 9 January 2011. ^ "Certifications – Search for: Wer". The Official Swiss Charts. Hung Medien. Retrieved 12 August 2011. ^ "Everyhit.com U2 Search". Everyhit.com. Retrieved 23 January 2010. Note: U2 must be searched manually under the album category. ^ a b "Certified Awards Search". British Phonographic Industry. Archived from the original on 24 September 2009. Retrieved 25 November 2009. Note: U2 must be searched manually. ^ a b c "U2: Charts and Awards". AllMusic. All Media Network. Archived from the original on 21 November 2009. Retrieved 13 January 2010. ^ "Gold & Platinum – Searchable Database". Recording Industry Association of America. Retrieved 12 August 2011. Note: U2 must be searched manually. ^ "Gold & Platinum – Certification Criteria". Recording Industry Association of America. Retrieved 12 August 2011. ^ "Search the charts". Irishcharts.ie. Retrieved 23 January 2010. Note: U2 must be searched manually. ^ "RPM archive". RPM. 21 May 1983. Retrieved 23 January 2010. Note: U2 needs to be searched manually. ^ "U2 – New Year's Day". Ultratop. Hung Medien. Retrieved 23 January 2010.
de la Parra, Pimm Jal (2003). U2 Live: A Concert Documentary (Updated ed.). London: Omnibus Press. ISBN 0-7119-9198-7. Reynolds, Simon (2005). Rip It Up and Start Again: Postpunk 1978–1984. Penguin Books. ISBN 0-14-303672-6.